Filing a case in a small claims court is one thing; winning and collecting the judgment from a tenant as a landlord is a completely different ball game. Once the hearing is over and the judge has reached a decision, there’s still a lot of work to do to collect the small claims court judgment. Before you can make any steps to collect the judgment from the tenant, the order has to be filed with the court in writing. Although the judge can setup a payment schedule, the court does not collect the judgment on your behalf. You’re basically on your own as a landlord. The written order is valid for 10 years. However, in order to increase your chances of success in collecting the judgment, you must take action as soon as possible. Most importantly, you must keep in mind that there’s no guarantee the judgment debtor will pay. Also, the courts don’t get involved in the collections process. You need to find the most appropriate method of collection for your circumstances. In the rest of this post, we’re going to discuss the different options for collecting a small claims judgment. The nitty-gritty of these methods may vary slightly with each jurisdiction but the methods generally apply in all states. The first step as a landlord to claim your judgment is reaching out to the debtor tenant with a formal letter demanding the judgment. You may remind the debtor that the judgment will reflect on their credit report but you must also be willing to negotiate a lower payment in case the debtor is financially constrained. Reaching a mutual understanding with the tenant can save you a lot of headache and valuable time later. A wage garnishment is typically the easiest method to collect a small claims judgment (provided the judgment debtor is employed) if the landlord and tenant/debtor cannot reach an understanding. All you need to do is provide information about the debtor’s employer and the judgment to a levying officer. The levying officer (or local Sherriff) will then collect the money on your behalf (capped at 25% of the debtor’s monthly wage). Although this method is relatively easy, it has restrictions; if the debtor’s wage is just sufficient for basic support and they can prove it, then you cannot garnish it. The same goes if they’re receiving government support, are employed by the military or federal government, or if the wage is also being garnished. A bank levy is when money is deducted from the judgment debtor’s bank account. Obviously you need to collect all the pertinent banking details of the debtor. If the dispute was business related, you can get this information from the debtor’s credit reports. That said, a bank levy has its limitations as well. For instance, money cannot be drawn from a joint account where the debtor is a signatory. The same goes for salary accounts, public funds, and retirement funds. A real estate lien allows you to claim a portion of the value of property that the debtor owns. To create a lien, you register the judgment in the lands records department of the place where the debtor owns property. However, this method is different as you don’t get paid any cash until the property is sold. You’re paid the value of your claim on the property from the proceeds of the sale. Depending on jurisdiction, there’s a limit on the amount you can collect from the sale. 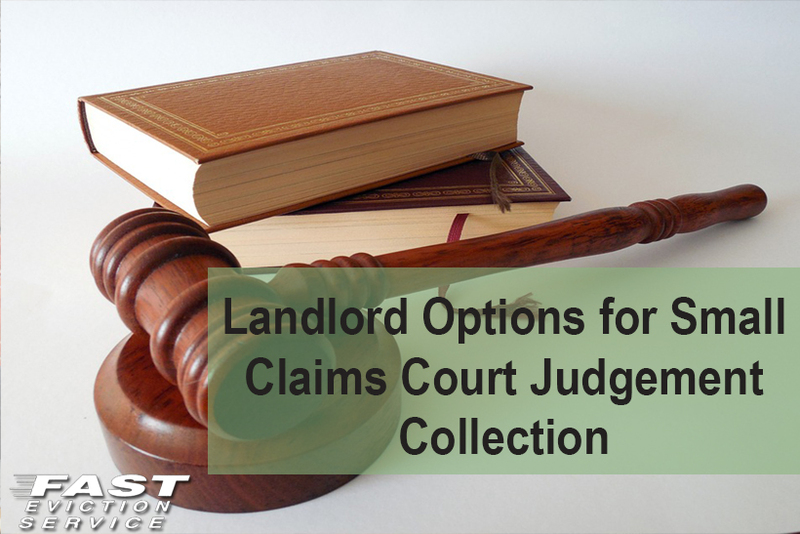 As most landlords find out, collecting a small claims judgment can be a pain. While there are a couple of options at your disposal, you should always first try to reach an amicable solution with the debtor. Moreover, every option has limitations that make it even harder to collect the judgment. Before you opt for an enforcement method, you need to obtain proof from the small claims court that you are owed money. When none of the methods listed above works, you can take things further and use court bailiffs to seize property or use a collection agency to track the debtor and collect the judgment for you. Most importantly though, as a landlord you must first consider and decide in advance whether collecting the judgment is worth the expenses and the trouble you’re bound to put up with in the first place.